Oman is an Arab-speaking nation of 3.1 million people. UNESCO estimates that there are more than 6,300 Omani students enrolled in higher education abroad, but other sources put the figure much higher, in the range of 12,000 students. To learn more about the opportunities that await foreign educators, we caught up with Mrs Ruby Sawhney of the Omani education agency Al Noor Higher Education Services Centre, and are pleased to present two video excerpts from our conversation below, as well as supporting information about this exciting market. Oman’s higher education system has expanded dramatically over the past two decades, from a single college in 1995 to a field of nearly 30 institutions today. There were roughly 90,000 students enrolled in Omani higher education in 2011, representing just over 28% of the 18-to-24-year-old cohort. This reflects a much lower level of higher education participation than is seen in many developed countries, where participation within this age cohort can run as high as 60-70%. Boosting the participation rate in Oman is one of the underlying goals of the government’s efforts to expand the domestic higher education system, and Oman has a stated goal to increase participation among 18-to-24-year-olds to at least 50% by 2020. 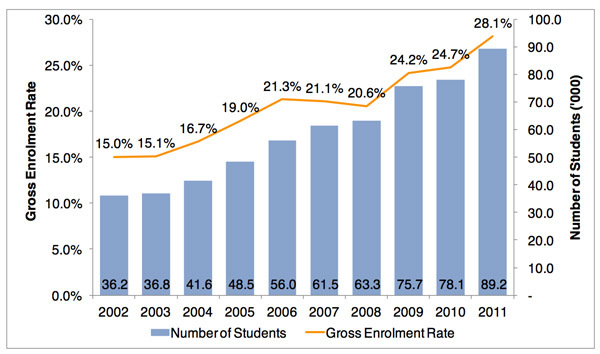 As it stands now, there are sufficient higher education seats in Oman to meet current demand. The expansion of the Omani system has been remarkable and has addressed important issues of capacity and access. However, such rapid system expansions are often accompanied by quality control challenges, and this has certainly been part of the story in Oman. The desire to pursue a higher quality education experience abroad keeps interest in studying overseas high – whether as self-funded students or with public or corporate support. Students are also keen to pursue an international study experience in order to develop greater global competencies, and to build foreign language skills. In the first interview segment, Mrs Sawhney explains the wide range of destinations for Omani students. The UK and Malaysia have been two historical favourites and remain popular today but, as we hear in the interview, the field is expanding to include other major English-speaking destinations as well as regional Arab-speaking hosts as well. Mrs Sawhney underscores the importance of the Omani government’s efforts at diversifying the economy from the traditional oil and gas base to a broader mix of manufacturing, retail, international trade, and health sciences. She notes as well the range of resulting training requirements and skills gaps that the government is also moving to address. The Omani government is doing so through increased funding for education, as noted below, but also through scholarship support for study abroad and by encouraging additional scholarship support from the private sector. In our second interview segment, Mrs Sawhney offers tips and advice for educators aiming to recruit both Omanis and expats. She describes Oman as an important regional gateway, one that is heavily influenced by its long history of international trading and by the dynamic mix of cultures that one finds in the country. Its strategic location, only a four-to five-hour drive from Dubai, makes it an ideal country to visit while on a recruitment trip in the Middle East. Mrs Sawhney recommends a variety of distinct strategies and tactics for recruiting expats as opposed to Omani nationals. Particularly for those institutions that aim to recruit Omani students, however, Mrs Sawhney highlights the importance of securing a place on the Ministry of Higher Education’s directory of Recommended External Universities. Inclusion on the Ministry’s list of approved institutions is required for students who wish to secure a government scholarship to study abroad. As is the case among other Gulf States, the government of Oman has expanded funding for education in recent years. Education and training spending totaled US$3.38 billion in 2013, accounting for roughly 10% of all public expenditures in Oman and representing a 25% increase over 2012. Increased investment in education has been driven by significant political and social pressures to better prepare younger Omanis to take up a range of professions in the modern economy in both the public and private sectors. The country has a large expat population and there are a number of economic sectors where expats hold the vast majority of jobs. Meanwhile, Oman’s Public Authority for Manpower Register (PAMR) estimates that more than 150,000 Omanis are registered as unemployed. The government is committed to increasing the share of employment for Omanis, but there are persistent skills gaps – in terms of professional qualifications but also in areas such as English-language skills – that have resulted in modest progress to increasing employment rates for Omanis. In terms of recruiting, the expat market begins with the K-12 sector, where international schools are thriving. There are over 40 international schools (including branches) in Oman, out of which, 18 are in the Muscat area. Such schools have roots in Bangladesh, Egypt, France, India, Iran, Pakistan, Sri Lanka, the Netherlands, the Philippines, the UK, and the US. This entry was posted in Agents, Higher Education, Middle East, Oman, Regions, Video Interviews and tagged recruiting expat students, student mobility, undergraduate student recruitment, international students, secondary schools for international students.